Flat, wide, and expansive – parking lots tend to be fairly similar around the country. And why shouldn’t they be? There’s no need to reinvent the wheel - when it works, it works. And your average parking lot is great at holding a lot of cars. Unfortunately, your average parking lot is also great at holding a lot of snow. That’s where you and your plow come in. Whether you’re plowing your own business’s parking lot or if the plow is your business, this simple list of tips, tricks, and best practices will ensure you get the job done as quickly and efficiently as possible so you can be back at home with a warm mug of cocoa in no time. Don’t just take down an address and show up with your Toyota Tacoma after the blizzard has already hit. When you take on a new client, come to the site and familiarize yourself. You’ll want to anticipate speed bumps, curbs, bushes, and fire hydrants that may blend in with the surroundings after a snow. If you own the parking lot, you may think you know it like the back of your hand, but it will still benefit you to take another look around with an eye towards plowing it. And now that you mention it, where did all these freckles come from? The long and short of it is it's better to be safe than sorry. You'll be excited once you've put a snow plow on your Ford F150, but be sure your truck is still in good shape come spring time. All of that snow has to go somewhere, and until it melts that means a sizable mini-mountain of snow will likely be sitting somewhere on the lot. Come to an agreement with your customer over where the pile should go, and try to find an area where the melting mass won’t be too much of a nuisance. - Never pile your snow up over drains. - Never pile your snow where it would block visibility from oncoming traffic. - Never cover or block handicapped parking spaces. 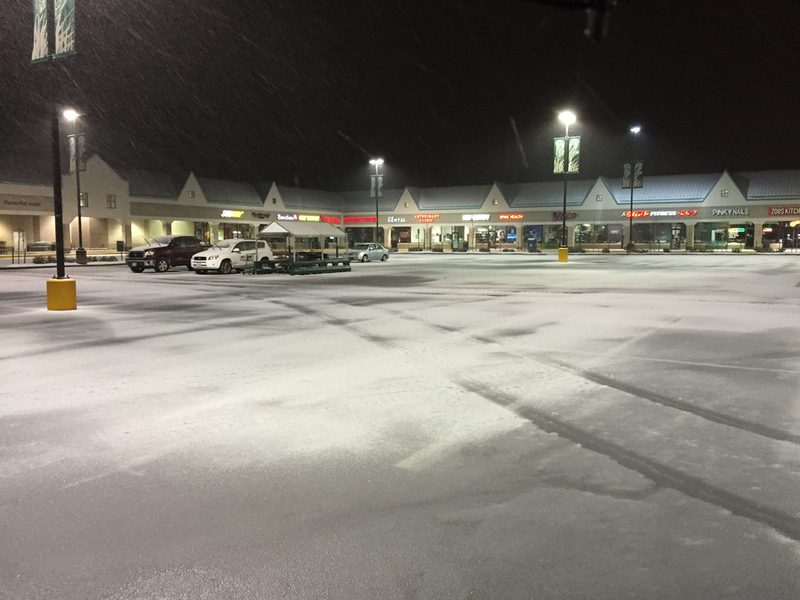 - And finally, conventional wisdom dictates that you don’t pile your snow in the center of the lot. And keep in mind, moving snow across public roads is illegal in many areas. If you think this is your only option, be sure to check your local laws before proceeding. It may be tempting for you and your Toyota Tundra to just hop on the interstate and really rid yourself of this snow, but once you see the blue and red lights in your rear view mirror you may wish you had made other arrangements. If a great deal of snow is in the forecast, you’ll thank yourself for plowing in waves as the snow falls. Once it piles up above a couple of inches, every step of the process will start to get harder, including driving out to the site. Think of it this way, your Chevy Colorado can plow, but it's still a consumer truck - so don't make it bite off more than it can chew. Even beefier trucks like a Ford F350 (while certainly up to the task of plowing) are not going to do too well against an upright wall of snow. You might be surprised by the powerful punch snow can pack once it’s being pushed into a mound by a Nissan Frontier, Dodge Dakota, or the like. The last thing you want to do is take a wall down, so play things safe and push snow away from the building, never towards it. Start by back dragging – and when you’ve cleared enough space, push the mounds further away from the structure. If piles of snow are literally touching the building, it's best to stick with salt and shovel for those areas. Your truck and plow are better used in wide berths, not for detailed corner work. 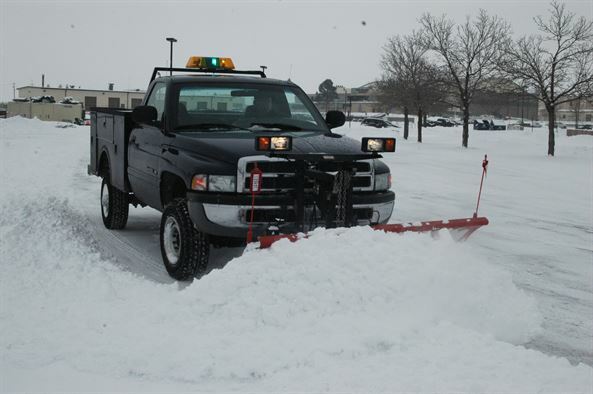 Drive up towards the building with your plow blade in the raised and straight position. 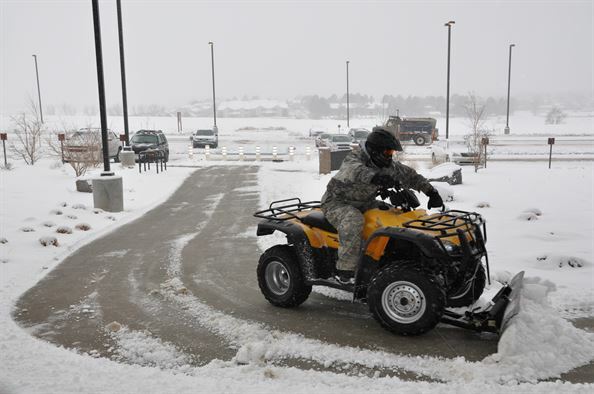 Once you’re as close as you plan to get, drop your blade and throw ‘er in reverse - dragging the snow back with you. Be sure to allow enough space for your vehicle to come around from the other side later on. Not only does this give you some room to work with, it also makes use of your powerful reverse gears. Whether you drive a Ford F250 or a Honda Ridgeline, your ride is designed to deliver extra torque in reverse, and this can be used to your advantage all winter long. Once you've got a solid perimeter set up, you're ready to start moving forward - literally! 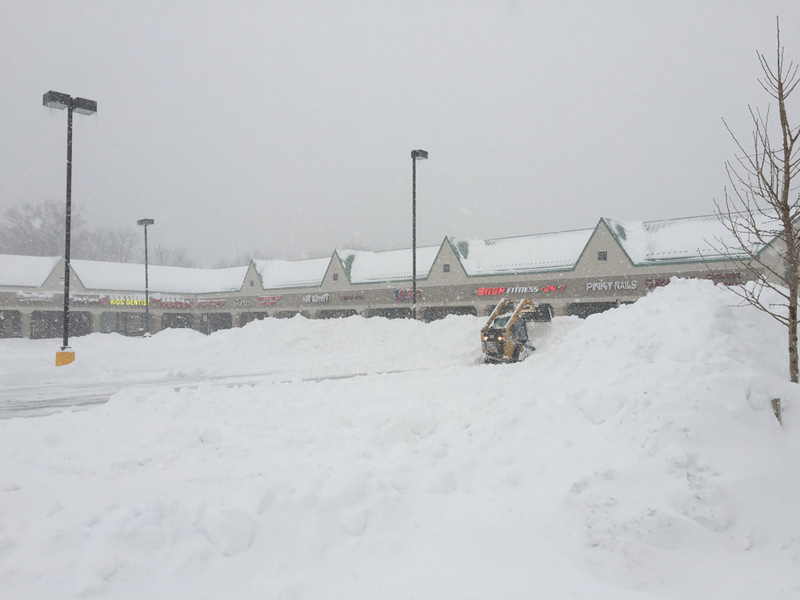 Just like mowing the lawn, go back and forth with your plow pushing snow to the far edges of the parking lot, and ultimately to your designated snow pile site. The width of your ride is what makes all the difference here. That's why it pays to get a snow plow for a Dodge Ram 2500 or other wide truck or SUV. A Toyota 4Runner for example, is going to be able to clear snow much faster than a riding lawnmower or ATV - but with patience you can do the job with either. 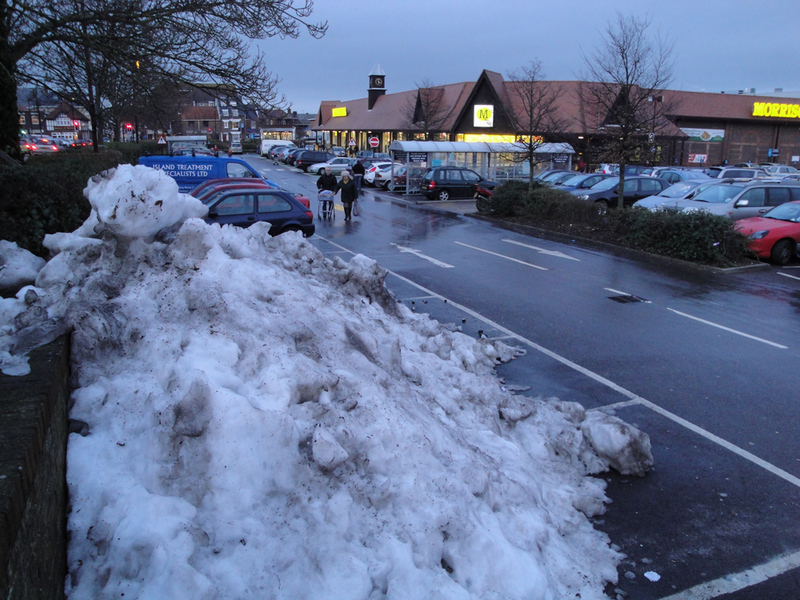 Once the majority of the snow has been removed, you can start to tidy up a bit. Plow close to the curbs now, and round off any blocky edges. Then, there’s nothing left to do but sit back and admire a job well done - that is, until the next blizzard blows through! When you keep these tips in mind, you can be the proud owner of a functional parking lot even in the heaviest of snowfall. If you plow for a living, your customers will be open for business and glad to have you on their side. And if you are in the market for a new snow plow, be sure to check out our selection of the best snow plows.